And of course got a "Trust the Process" in there. 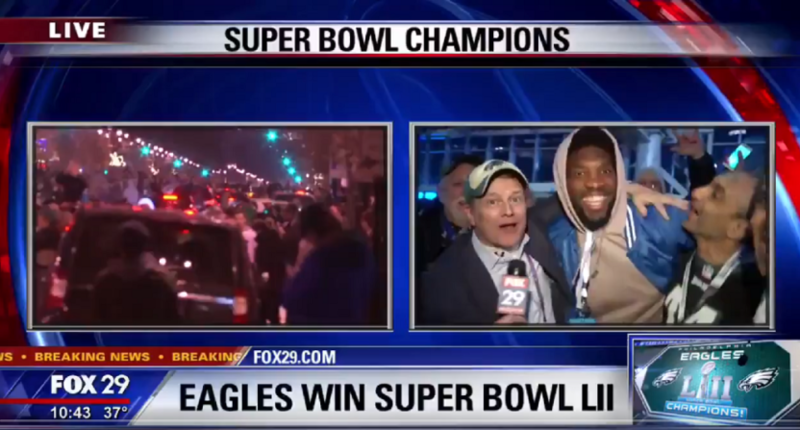 After the Eagles took down the Patriots 41-33 to win Super Bowl LII, Fox 29-Philadelphia got a nice surprise while interviewing fans on the streets. 76ers star Joel Embiid was among those celebrating, and jumped on Fox-29 for a quick interview (to the delight and shock of reporter Chris O’Connell). Embiid said “We up next!” and of course made sure to drop a “Trust the Process” before heading out. Embiid crashed live local TV station. Led by a tremendous young duo in Embiid and Ben Simmons, the 76ers are certainly on the rise and would be in the playoffs if the season ended today. So, they may indeed get a shot at a title of their own in the near future.